Shaqiri's 100% Liverpool record & could we witness Anfield's 1000th Premier League goal? Shaqiri’s 100% Liverpool record & could we witness Anfield’s 1000th Premier League goal? 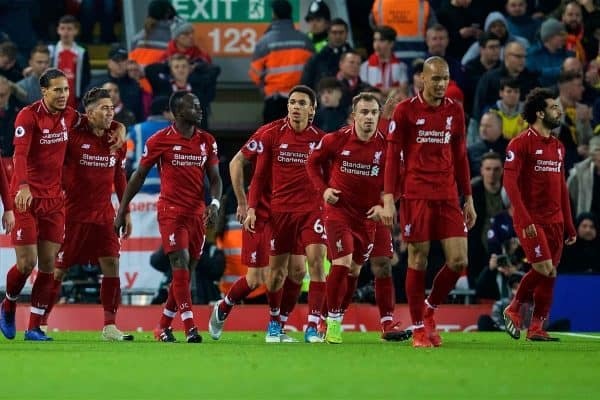 Liverpool host Crystal Palace in the Premier League at Anfield on Saturday; here are the best stats and facts as the Reds look for a 19th win of the season. In this fixture last season a single goal from Sadio Mane settled the game. The Reds are seeking a second successive league double over Palace. Home and away Liverpool have won the last three against Palace; they have never won four. In the Premier League Liverpool have won 11 meetings with three draws and five defeats. At Anfield the Reds have won five, drawn once and been beaten three times. The Reds are two goals short of recording 1,000 at Anfield in the Premier League era. 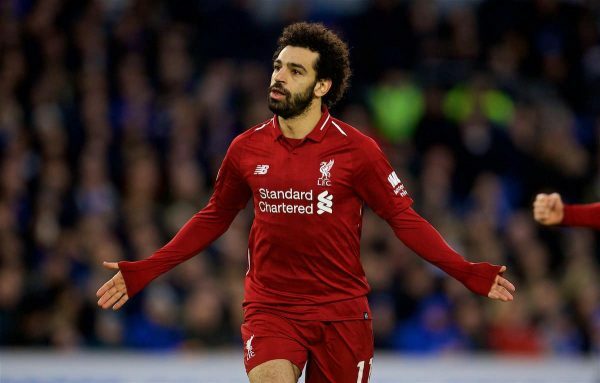 In the 19 Premier League clashes between the teams there have been 65 goals scored at an average of 3.42 goals per game, with Liverpool scoring in all but two of the meetings. The Reds have found the net in each of the last 11 top-flight clashes with Palace. There has only been one goalless draw at Anfield in 18 league meetings; that came in December 1994. The Reds’ biggest-ever top-flight league win came in September 1989 when the Reds won 9-0. They set a league record when eight different men found the net that evening. Milan Baros is the only player to score a hat-trick in a league game between the sides, doing so in November 2004 in a 3-2 Reds win. 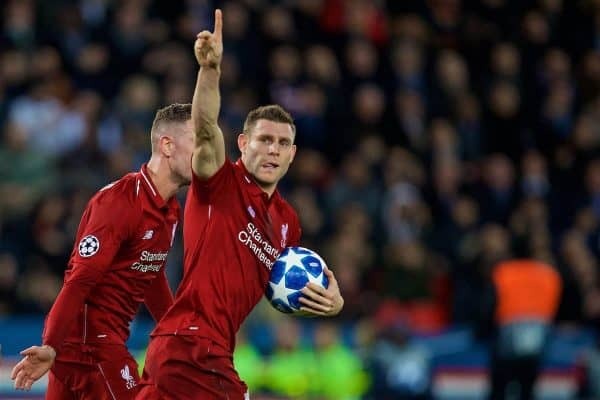 When James Milner scored his penalty against Palace in August he became the first player to score eight consecutive goals from the penalty spot in the Premier League. Milner was sent-off against Palace in London in March 2016, with the Reds coming from behind to win 2-1 with 10 men. Sadio Mane has scored in each of the last three league encounters with the Eagles. No Liverpool player had previously ever achieved that feat. Joel Matip scored his first Liverpool goal against Palace at Selhurst Park in a 4-2 win in October 2016. Andy Robertson made his Reds debut in this fixture last season. The Reds have won all 10 Premier League games this season when Xherdan Shaqiri has started. Since the defeat to Palace in April 2017 Liverpool have gone 31 league games unbeaten at Anfield, winning 22 and drawing nine. They have conceded 13 goals and kept 21 clean sheets in that sequence. The current run is their joint-third longest in history. 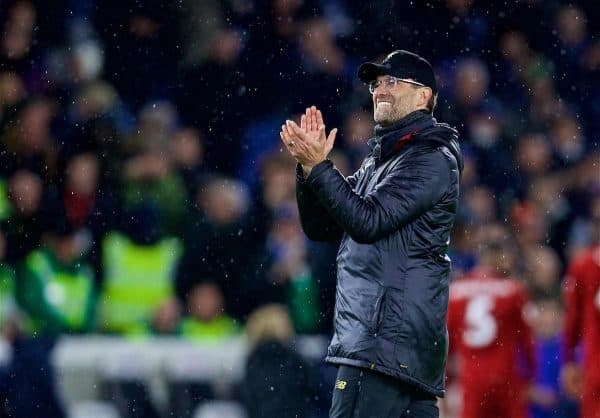 Last weekend’s 1-0 victory at Brighton saw Liverpool’s 50th league clean sheet under Jurgen Klopp. 42 percent of those have come since Virgil van Dijk made his league debut in January 2018. 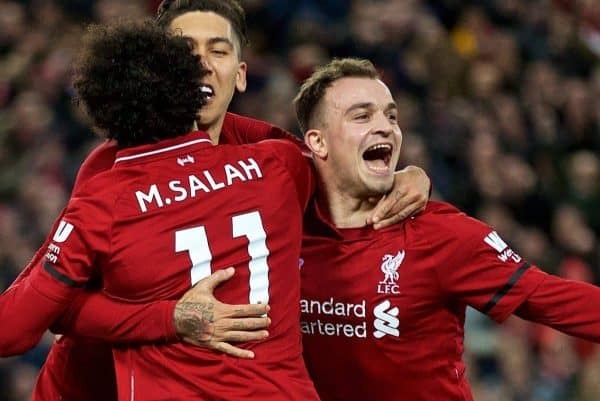 Liverpool’s current points tally of 57 is their best after 22 games of a league season since their first campaign as a Football League club in 1893-94, when they accrued 58 at the same stage (adjusted to 3 points for a win). A victory today will see the Reds set a new club record after 23 matches for points won (60) beating the 59 in 1893-94 and 1987-88. Palace’s home defeat to Liverpool last August was the 100th defeat suffered by Roy Hodgson during his managerial career in the Premier League, in his 252nd game. Martin Kelly played 62 times for the Reds during his time at Anfield, scoring his only goal in a League Cup win at Chelsea in November 2011. He has started three league games since he faced Liverpool back in March. Christian Benteke played 42 times for Liverpool in his one season at Anfield, scoring 10 times. He netted nine goals in 29 league appearances. In his 11 career games against the Reds he has scored seven times including both in Palace’s 2-1 Anfield win in April 2017. 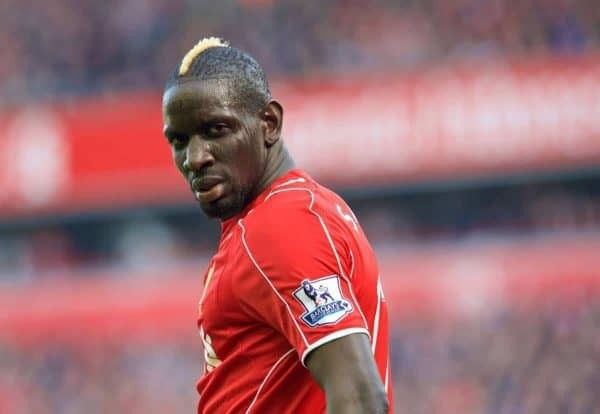 Mamadou Sakho played 80 times for the Reds in all competitions from 2013-16, scoring three times. 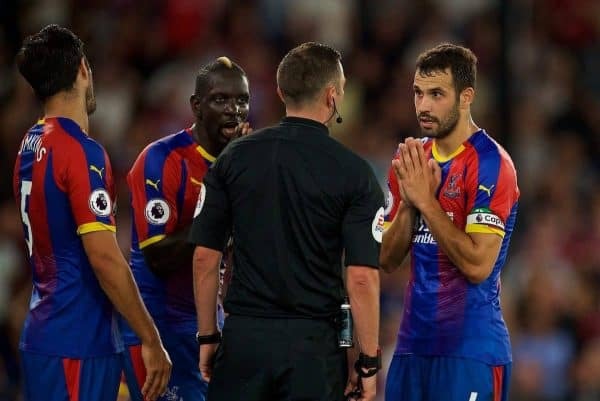 Palace have five league ever-presents this season: Mamadou Sakho, Patrick van Aanholt, Andros Townsend, Luka Milivojevic and James McArthur. Luka Milivojevic has scored in four of his last eight league games. He has scored five penalties this season in the Premier League, more than any other player. Milivojevic was the top-flight’s leading penalty scorer last season with seven. Julian Speroni could appear in goal for Palace for the first time since his side’s 3-2 home defeat to Arsenal in December 2017. The Eagles have kept clean sheets in four of the last seven league and cup fixtures. Palace have won four of their 11 top-flight away matches this season. They won 2-0 at Fulham on the opening day and have taken maximum points at Huddersfield (1-0), Manchester City (3-2) and Wolves (2-0).